The tort reform state lawmakers passed in 2003 made it more difficult for patients to win damages in any health care setting, but none more so than emergency rooms, where plaintiffs must prove doctors acted with "willful and wanton" negligence. Tort reform advocates say the law is needed to protect ER doctors operating in volatile environments. But medical malpractice attorneys argue the threshold is nearly impossible to cross. “You’d have to be a Nazi death camp guard to meet this standard,” says one. *Connie Spears died in her sleep on April 29, 2013. A cause of death was not immediately known. 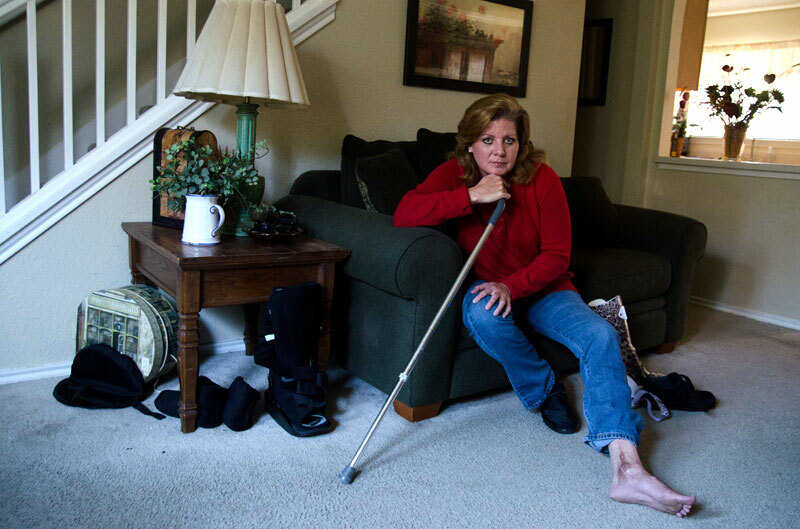 The leg pain Connie Spears felt was excruciating and familiar: She’d had blood clots before, and doctors had installed a filter in one of her heart’s main veins. But at a Christus Santa Rosa hospital in San Antonio, where Spears went the Friday before Memorial Day seeking help, the emergency room doctor ran some tests and discharged her with “bilateral leg pain.” He told her to follow up with her primary care physician. Three days later, delusional and with legs the color of red wine, Spears called 911 and was transported to a different area hospital. This time, doctors determined the 54-year-old’s vein filter was severely clotted and had led to tissue death in her legs and kidney failure. When she regained consciousness weeks later, Spears could hardly handle her new reality: Doctors had amputated both legs to save her life. Spears’ outrage over the first ER doctor’s diagnosis and the loss of her legs has been compounded by her inability to find a medical malpractice attorney to represent her. One after another, they’ve told her the same thing: She has a great case — but not in Texas. Officials with the Christus Santa Rosa Health System say they cannot comment on the case due to patient privacy and confidentiality policies. The tort reform state lawmakers passed in 2003 — the most sweeping in the country — made it more difficult for patients to win damages in any health care setting, but none more so than emergency rooms. The new law capped medical liability for noneconomic damages at $250,000 per health care provider, with a maximum award of $750,000. Less well known was new language to safeguard under-the-gun emergency room doctors from civildamages unless it could be proved that they acted with “willful and wanton” negligence — that they not only put the patient in extreme risk but knew they were doing it. Plaintiffs must prove that ER doctors acted with conscious indifference, or gross negligence, rather than simple negligence. Medical malpractice attorneys, who say their ranks are already dwindling in Texas because of tort reform’s damage caps, argue this is a near-impossible threshold to meet. Tort reform advocates say that’s simply untrue and that patients across the state continue to sue doctors and hospitals over emergency care. They say the “willful and wanton” language, along with damage caps, has driven down malpractice insurance rates and attracted more ER doctors to Texas, where they have the legal protection to work in volatile environments. Since the new law went into effect, doctors’ malpractice insurance rates have fallen by nearly 30 percent statewide, according to the Texas Department of Insurance. And 82 Texas counties have seen a net gain in emergency physicians, including 26 counties that previously had none, says Jon Opelt, executive director of the pro-tort-reform Texas Alliance for Patient Access. “It has really enhanced the number of high-demand specialists — neurosurgeons, obstetricians, anesthesiologists — in parts of Texas where there weren’t any,” says Rocky Wilcox, general counsel for the Texas Medical Association. But medical malpractice attorneys say these developments have come at the expense of Texas patients. Texans expect to receive extraordinary care in an emergency room, the attorneys say. Instead, state courts have ruled that a “lower standard of care” is acceptable for doctors practicing in ERs. They argue the “willful and wanton” rule means emergency room care in Texas is some of the most dangerous in the country, because no one can be held accountable for botched diagnoses or flat-out wrong care. Jennifer McCreedy’s whole life changed with a small stumble on her front porch in July 2006. The San Antonio single mother, an avid country line dancer and full-time mortgage counselor, heard a crack and thought, “Shoot, I broke my ankle.” While her 10-year-old slept, McCreedy called her older daughter, who took her to the emergency room with her foot dangling off of her leg. McCreedy’s bone fracture was major — she broke her ankle in three places, and the bones were severely dislocated. Despite spending four hours at San Antonio's Methodist Hospital, she never saw the doctor overseeing her case, never heard from an orthopedic surgeon and was kept in the “fast track” — or less critical — section of the emergency room. She never had her bones set back in place, which orthopedic surgeons say is key to reducing swelling. A physician’s assistant put her in a splint and told her to follow up with an orthopedic specialist for surgery, sending a surprised McCreedy home. When McCreedy got in to see an orthopedic surgeon the next day, the splinted ankle was so swollen that surgery was far too dangerous. After 13 days spent trying to reduce the swelling, her surgeon decided he couldn’t wait any longer. By that point, the damage had been done. A surgery that normally takes an hour ran more than four hours, her surgeon testified in a court deposition. He had to slice her Achilles tendon, he said, to lengthen contracted muscles. Because of the swelling, McCreedy’s wounds refused to heal, her surgeon said, eventually requiring a graft, and likely leading to permanent nerve damage. Over the last few years, McCreedy, now 52, has had five surgeries and is permanently disabled. She walks with a cane and is in so much pain from end-stage arthritis that she can only work 15 hours per week. She went from being a financially secure and hyper-involved parent to hiding from creditors, nearly losing her home to foreclosure, canceling her son’s health insurance and asking her older daughter for cash. The lowest point? Sobbing as she watched her adolescent son empty her bedpan. McCreedy, with the help of Mittler and Powell, sued emergency room doctor Robert Frolichstein, who testified that he should have seen McCreedy himself, should have called the on-call orthopedic surgeon and should have read McCreedy’s medical charts more closely before discharging her. Though he has no recollection of the patient or her condition, Frolichstein testified in court that he must have acted with the best information he had, and stands by the decision to splint her ankle and discharge her. “Apparently there was some set of circumstances that made us develop this plan that at the time we felt was reasonable and safe for Ms. McCreedy,” he testified. Frolichstein did not return phone messages left at the emergency department where he currently works — a different Methodist hospital. Palmira Arellano, a spokeswoman for the Methodist Healthcare System, says patient privacy rules and pending litigation prevent her from speaking about the case. After a two-week trial this fall, it took a jury less than an hour to rule in the doctor’s favor, finding that his conduct did not meet the “willful and wanton” threshold. Malpractice attorneys say that unless the doctor comes to work drunk or high, the gross negligence threshold effectively requires the plaintiff to be able to read the doctor’s mind. State Sen. Rodney Ellis, D-Houston, has unsuccessfully filed bills in each of the last three legislative sessions to change the law back to regular old negligence. But Opelt, with the Texas Alliance, says trial lawyers are doing a lot of hand-wringing for people who are still aggressively filing emergency room lawsuits. His research shows that between late 2003 and the end of 2008, 799 suits were filed against Texas emergency room doctors, resulting in 163 payouts totaling $31 million with an average payout of $193,000. “People can and do sue, and can and do collect, under the current gross negligence standard,” he says. Yet the 2003 changes clearly have had an effect. A preliminary study co-authored by Charles Silver, a professor at the University of Texas School of Law, shows that medical malpractice claims in Texas dropped by 60 percent between 2003 and 2007, the years immediately following tort reform. Payouts per claim dropped by a third in the same time period. There are no statistics specific to emergency rooms. Those who are sticking around are increasingly limiting their clients to wealthy executives, he adds, because they can go beyond non-economic damage caps and seek compensation for lost wages. They can’t make any money off of the elderly, or housewives like Spears, he says. For Spears, the double amputee, the frustration — and humiliation — is daily. She needs help to go to the bathroom, to shower, to get from room to room. She can’t pick up her grandchildren. She went from cooking, cleaning and caring for her own elderly mother to being completely reliant on everyone else. Christus Health is a $25,000 sponsor of The Texas Tribune's TribLive conversation series.